"For thousands of years, the hope of heaven has called to people through miracles. When we stop to consider their stories, God's voice calls to us as well. "In our age of constant innovation, technological achievement, and the sad tendency to see ourselves as the captains of our fate, we may be tempted to make little time for miracles, or give little credence to them. But to live our lives without a sense of the miraculous is to live impoverished lives. Our word for miracle comes from the Latin word mirari, "to wonder." And well might we wonder when we consider the nature of miracles and their purpose. It is here that a grand conversation beckons. God has been our help in ages past. He is our hope for years to come. To learn of holy events and people -- supremely, to look upon the Savior -- is to see the power of God, and how He has always sought to draw us to Himself. He is our eternal home. Miracles point the way there. In this audiobook are scenes and lives touched by eternity, settings of almighty declaration, moments marked by deliverance, by mercy, or visionary unfoldings of God's divine intent.Kevin Belmonte provides learned insight into the profoundly important history of miracles. 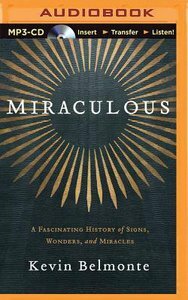 Miraculous is a richly researched text of wondrous things that have taken place from ancient times to the present. Kevin Belmonte is a visiting author at Gordon College and the lead historical consultant for the major motion picture Amazing Grace. His first biography, William Wilberforce: A Hero for Humanity, received the prestigious John Pollock Award for Christian Biography Winner of the 2003. Belmonte has edited Wilberforce's classic apologetic work A Practical View of Christianity and served as a script consultant for the BBC. Moast recently he has authored Christian Encounters Series: D. L. Moody. He and his wife, Kelly, along with their son, Samuel, reside in New England.